David Berlow and staff drew Apres as part of a series originally designed for the Palm Pre smart phone. It is available in five weights and four widths, with italics, for a total of 40 styles. Simple, open letterforms and generous proportions provide an inviting experience for navigation and readability. The classical geometry is regular and balanced, without being static or mechanical, for a friendly and forthright familiarity. In 2009, Roger Black commissioned Prelude, an original sans serif design by David Berlow, while consulting with the Palm smartphone manufacturer. Prelude was developed for the Palm Pre device and its WebOS operating system — a family of six fonts later expanded to 24 styles. As the name implies, Apres followed Prelude. In a savvy move, Palm’s marketing team commissioned this complimentary typeface for packaging and advertising. Richard Lipton drew additional styles and Dyana Weissman assisted with drawing and kerning. Apres and Prelude made for a fully-realized, unified system that years later still feels very ahead of the game. Eventually, Prelude was slightly modified and became Apres RE, which was released as part of the Reading Edge series of fonts for small sizes on digital screens. 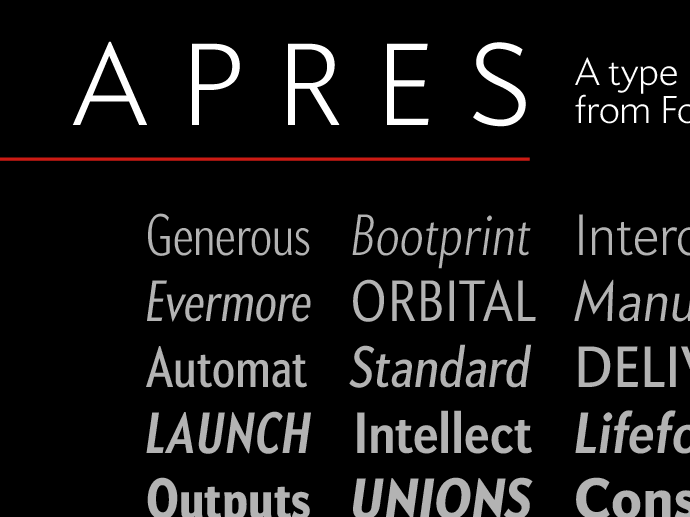 Apres’ 40 styles: Extra Condensed to Normal widths, from Thin to Heavy weights. License Apres. Available in 40 Styles. Apres is simultaneously available as webfonts from Webtype. Apres RE is an original member of the Reading Edge series and has been available from Webtype since 2010. Update: The use of “geometric” is now more descriptive than categorical. Apres has many characteristics that veer away from strict geometric classification.